A run toward safety for 3-6 brave adventurers of 8 years and over. In the deep jungle archeologists finally find the ancient pyramid they are looking for. Inside, they find the magical idols, the key to finding the lost treasure! But the builders of the pyramid have not left their secrets unprotected. The earth starts shaking! Falling rocks are everywhere! The pyramid is collapsing! It is time to run! To the exit! To the exit! 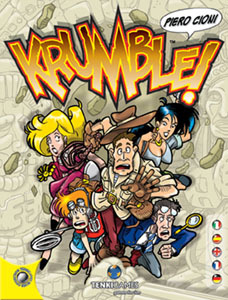 In Krumble! the object is for each player to run out of the falling pyramid. Players must try to keep idols with them and reach the vehicle to escape from the area. They will use all their characteristics to reach the exit and the winner will be the player less damaged amongst the survivors. And if an adventurer is smashed by the falling rocks? He will start to play as a Guardian Ghost! Game components: 72 tiles to build the pyramid: 54 corridor tiles, 6 exit tiles and 12 obstacle tiles. 12 obstacles markers which represents the obstacles when played on the tiles. 108 wooden pieces to keep track of the characteristics of each adventurer, 36 red cubes for Strength, 36 blue cylinders for Agility and 36 yellow pyramids for Knowledge. 6 characters tiles which represent the 6 brave archeologists. 2 special tiles which represent the vehicle and the idols base. 6 characters stand-up counters, to put into the plastic bases, to show the position of each adventurer. 2 idols stand-up counters, to put into the plastic bases, to show who takes them. 8 plastic bases to be used with the stand-ups. 1 die.